Jordy Liz Blogs: Five ways to encourage new moms. Five ways to encourage new moms. I have loved many, many aspects of motherhood. I love watching this baby - the one I worked so hard at growing and developing inside me - grow and develop outside of me. I feel a sense of pride and accomplishment when he meets or exceeds the expectations of him listed in the books. I wake up to see his smile grow as I inch near his crib in the morning. I can't wait to go pick him up from daycare in the afternoons. I love that his head turns and looks around when he hears my voice in the room. I love all those things and more, and I love him more than anything living or breathing on this planet. But the one thing I didn't expect to feel is lonely. And mentally exhausted. And the need to see just a snippet of my old self through spit-up covered clothes, feeding schedules, and baby toys scattered through the living room. And as a new mom, it's hard to know what to expect. Yes, even with all of the What to Expect books out there. 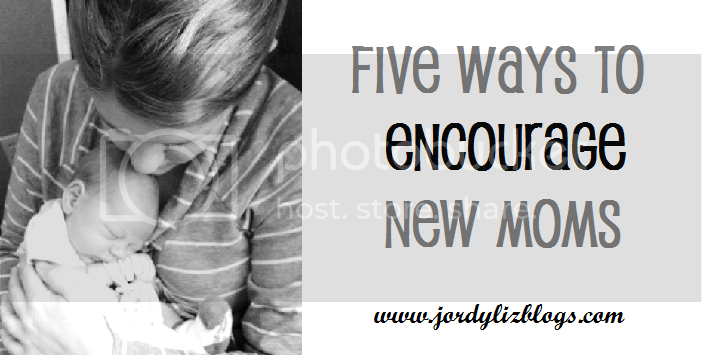 So if you know a new mom, here are five ways you can encourage her through this new journey. 1. Don't stop the phone calls, emails, or text messages. Once the first month or so comes to an end, the visitors thin, the dinners stop coming, and the buzz and excitement about the new baby dies down a bit. You might think she's too busy or maybe you don't want to bother her. But the truth is, she probably needs your phone call or text more than anything right now. Ask about her baby and ask about her. On those lonely days when the baby won't stop crying and she feels like everyone has forgotten about her, that message can be a lifeboat. 2. Don't stop the invitations. Like phone calls and texts, keep including her in plans just like you did before she had a baby. Invite her to grab coffee. Invite her to happy hour. Invite yourself over for lunch. Again, you might think she's too busy or that it's too complicated to leave the house with the baby, but don't make those assumptions for yourself. If she's anything like me, she is dying for someone to call her to just get together - even with the baby in tow. She might say no five times in a row, but it's most likely not because she doesn't want to. Babies are schedule-suckers and she might have had to legitimately say no because the baby wasn't having it. Ask a sixth time. And a seventh. Again, your invitation can be a lifeboat. 3. When you come over, ask what you can pick up for her from the store. In the early days with a new baby, going to the grocery store seemed daunting. Trying to figure out how I was supposed to get myself dressed, get my baby dressed, get out in the car, then load him up in the stroller just to run in for a quick trip - I couldn't even go there in my exhausted mind. Fortunately, I had a friend text me and ask what she could bring from the store. I asked for a big jug of drinking water. That was it. But I had spent three days wondering how I was going to get it and didn't know how to ask for help - not even my husband. It's the little things that make a big difference and take a huge load of our new mom shoulders. 4. Show up on time. Whether you are dropping off a meal or meeting her out for coffee, show up on time. Babies' schedules are down to the minute in those early days and there isn't much flexibility on their part. When they're hungry, they're hungry now. If she knows your coming over or meeting her at 5, she most likely did her best to make sure the baby was happy, fed, changed and on their way to sleep by 5. When you show up at 5:30, it's all out the window. And that's stressful for a new mom. 5. Drop off a fancy coffee or treat on your lunch break. New moms are most likely exhausted at any given moment - morning, afternoon, and evening. Likewise, they rarely have a chance to treat themselves. I make coffee in the morning only to get a sip in before it goes cold and stale. Drop off a latte and snack to a new mom in the early afternoon as a pick-me-up. Just give her a bit of notice to make sure she's home, and tell her you just want to stop by, say hi for two minutes, and leave her a treat. What are other ways you can encourage new moms? Those are great. I'm always hesitant with new moms, afraid I'm bothering them, or they might be resting, or too busy, or too tired! It really does help to hear your take on it! This is such a great post with wonderful information .... thank you for sharing. I'm currently 16 weeks pregnant with my first and I'm nervous, excited, anxious, and every other emotion imaginable! I hope my friends don't forget me after the first month!!!!! Don't be nervous! I think had I known what I know now, I would have made sure to be more intentional with my friendships while pregnant. I, too, have to continue being intentional now, and not leave it all up to everyone else. Best of luck with the rest of your pregnancy, Motherhood is a wonderful adventure! My sister and sil just had babies and I know they would agree with you. I am trying to support in any way that I can. Thanks for sharing! These are all lovely tips! I like to take it a step further and send a new mom off to shower or nap while I visit them!